We’ve had some fun and exciting things happen lately. Last month, Eric and I went to Vegas for a whole week for ASCA’s World Clinic (for swimming coaches). It was a lot of fun and we learned a ton. We got to meet Olympian Tyler McGill, see Phelps’s coach and listen to some amazing speakers. 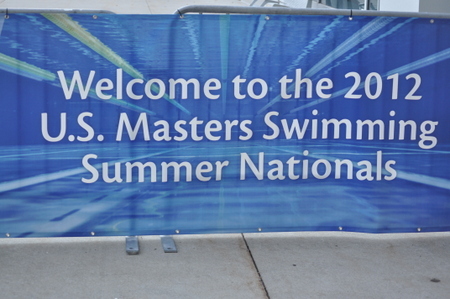 First, I have to say that Omaha did an amazing job running the Masters Nationals. It seemed to run really smoothly and just seemed very professional. After going to Trials there the previous week, it was even more fun to be there this time around. It was more relaxed and everyone was allowed to walk around more freely. 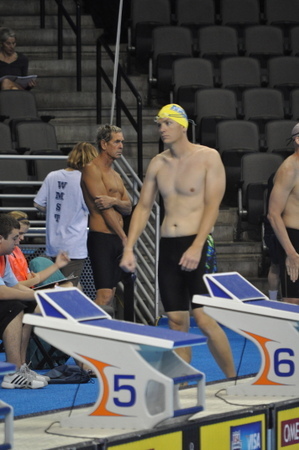 Eric already told you that the Masters’ swimmers were able to use the warm-up pool that the Trials’ swimmers used. The spectators were also able to go look at it. 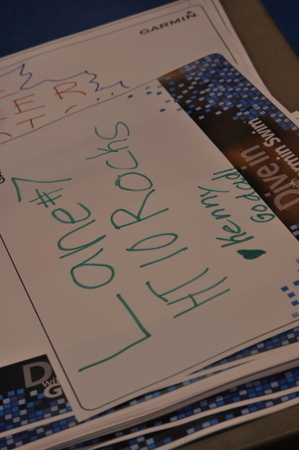 They had the vendor tables set up around the warm-up pool, including Garmin and their new Garmin Swim. There was also this cute shirt that a vendor had that said “I swam in the Trials” followed by an exclamation point. In the exclamation point was the word “pool”. We should have bought that one for Eric. But, we had just bought us all either Phelps or Lochte shirts the week before. 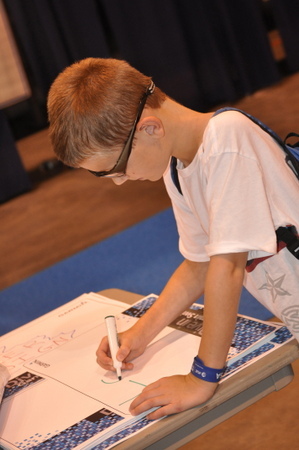 There were also blank posters that you could fill out to cheer on your swimmer(s). Besides being able to walk around the warm-up pool, spectators were also able to walk on the actual competition pool deck. At one point I “coached” Eric from the side of the pool to make sure that he stayed on track with the time that he wanted to make. I really didn’t have to anything since he was doing just fine on his own. Eric and two other coaches on our swim team swam with MOVY (Missouri Valley) so they could compete in relays. Eric did great in his events. He swam nine events (relays and individual) and got top ten in all of them. Top ten receives a medal so he came home with nine medals. Actually, he came home with eight because they ran out at the end. They’re going to mail him the final one. Thank you Omaha for a great meet experience! When competing at US Master’s Swimming national championships I was able to try out the soon to be released Garmin Swim watch. The watch is intended for indoor pool use, not open water swimming. It does not have a GPS, but instead calculates your distance and stroke by the use of an accelerometer programmed inside the watch. After signing my life away at the Garmin vendor booth, in case I didn’t bring it back they could hunt me down, I strapped on the watch and took it to the warm up pool to try out. The watch itself is black and the same size as a regular Timex ironman wristwatch. The watch has 6 easily accessible buttons and an easily readable digital display with button activated backlight. The design appears sturdy and contains a CR202 traditional watch battery that should last about one year. When needed, the owner, can easily remove the back of the watch and replace the battery. After checking out all the features it was time to get in and try it out. Before swimming the watch has to be set with the size of pool that you are swimming in. The watch comes preset with selections of 50 meters, 25 meters, and 25 yards. There is also a custom setting if you encounter something different. I selected the 50 meter size and jumped in the water and warmed up with a 200 free. When I finished I stopped and looked at the watch and it had correctly calculated my distance, the number of lengths I swam, my pace, and calories burned. It was also keeping track of my total swim time. I continued warming up and mixed up the strokes a bit to see if that affected the accuracy of the watch. I did a 200 IM and again the watch correctly interpreted the distance traveled. I kept swimming until I hit 600 meters and finished warming up. I was able to review the total distance I swam, the calories burned, total swim time, lengths completed and my pace per 100. These were all the preset fields, but Garmin says the fields can be customized to display other things if you prefer. I returned to the Garmin booth and the Garmin Sales person told me how the watch will wirelessly sync over bluetooth after completing your workouts. When the workout is downloaded you can review several things about your swim. The watch can differentiate between the different strokes and will tell you how far you swam each stroke, but as of now this information can only be seen after downloading the information into the computer. There is also a training intervals feature that can be used during practices to keep track of the time, distance, and number of intervals that you have completed. The watch can be turned into the interval mode and when completing each interval you push a button to indicate you are resting and then start time again when you leave on your next interval. At the conclusion of the interval you will be able to see your total time, total rest time, and total swim time, along with your total distance and pace. There is also a drill mode that you can turn the watch to when completing drills. Since the watch is programmed to recognize the 4 competitive strokes, drills may not be recognized, so you can go to drill mode and when you are done, the watch allows you to enter your total distance to add to your practice total. A couple of the other features it has includes calculating your stroke rate and swolf. Swolf is the number of strokes that it takes to complete a length plus the time it takes to complete the length. Swolf is a measure of swimming efficiency. The lower the number the better. In all it seemed that the watch worked very well. For any fitness swimmer it would make a great training tool and would be a great way to keep track of your workouts. Watch does not display the distance swum of each stroke, has to be seen after downloaded. I did speak with the Garmin reps about this and they said several swimmers at the meet had commented on this and would likely change that with a software upgrade in the future. The only thing I would like to see added, would be a way to pre-program practices into the watch and then select them and swim them at the pool. Hopefully Garmin will get some feedback and add this feature in a software upgrade. 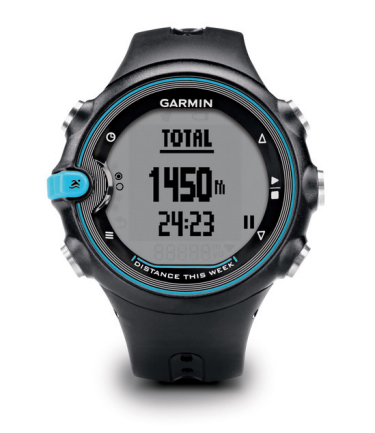 Garmin is releasing the watch to the public in August and will retail for $150.00. 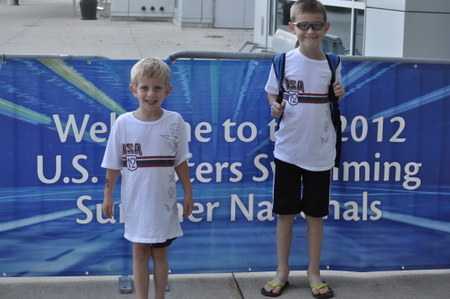 Last week from July 5th-8th, 2012, United States Master’s Swimming hosted the 2012 summer nationals in Omaha, NE. 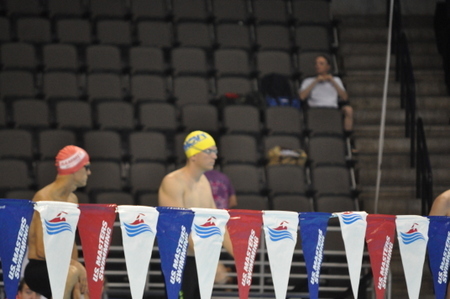 This year was especially exciting because the meet was in the Olympic Trials pool inside the Century Link Center in Omaha. I was lucky enough to get to participate in the meet and experience a little of what the Olympic Trials swimmers experienced the week before. The set up of the pools was left the same as it was for the trials swimmers, so if you watched Trials on TV you can see how it was. I qualified and swam in 5 individual events the, 50m, 100m, 200m and 400m freestyle and the 200m Individual Medley. 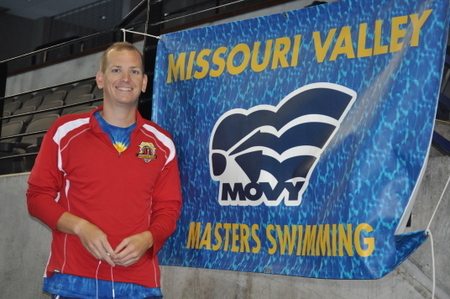 I also swam with the Missouri Valley Master’s Club (MOVY) and swam on the men’s 200 free relay, mixed 200 free relay, men’s 200 medley relay (backstroke leg), and the mixed 200 medley relay (backstroke leg). It was exciting to be participating in a major competition again, my first since graduating college. All the big meet touches and atmosphere were present. They had a great announcer who announced and gave narration during the races. The jumbotron was on and broadcasting the races as well. The whole meet was broadcast throughout the TVs in the Century Link Center and broadcast on the web as well. The Omega timing system with the high-tech digital camera back up system was timing the meet and all results were displayed on the jumbotron beside your name. The blocks were the high-tech Myrtha blocks with built-in reaction timing mechanism. Your reaction time to the starting buzzer was displayed on the scoreboard after take off from the blocks. It was my first time using the blocks with the fin on the back. It took some getting used to, but USMS had volunteer coaches on the decks that gave advice on the best way to utilize the blocks. The fin on the back is adjustable from 1-5 and it took a few starts to find the best setting for me. Then it took a few starts to figure out the best placement of my back foot on the fin (have the ball of your foot about halfway up the fin), but they definitely give you an extra boost off the blocks and were a great experience to use. The competition pool itself is the fastest in the word. Using science and technology Myrtha builds the pools specifically to swim fast. The pool was 2.5 meters deep to prevent currents from rebounding off the bottom, the lanes were extra wide and the ropes prevented waves from coming from the other lanes. The gutters were overflow gutters so the water did not rebound off the walls and come back. All the jets and filtering system components were kept deep in the bottom of the pool to prevent any currents from affecting the swimmers. The water was kept at 81 degrees, so as not to be too hot or too cold for racing. 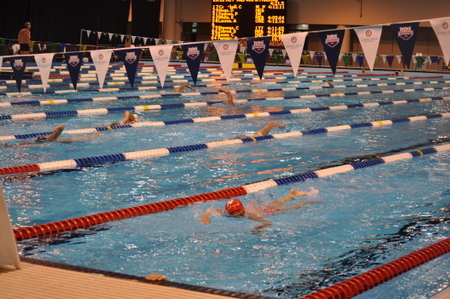 The warm up pool was an exact replica of the competition pool and was in the convention hall next to the arena. There was another scoreboard inside the warm up area so you could warm up and keep an eye on the current event and heat that was swimming while warming up. There was also a 25m 6 lane pool attached to the warm up pool with sprint lanes to practice starts from the blocks. All in all there was plenty of warm up area to get ready for races and cool down afterwards. There was also a slimmed down version of the aqua zone that they had at Olympic Trials. Several vendors stayed at the meet and were selling their products at discounted rates. Speedo, TYR, Blueseventy, Garmin, Nike, and other vendors were there. Garmin brought fifty of their soon to be released Garmin Swim watches that could be tried out before buying. The watches will be released to the public in August and will retail for $150. During warm ups I was able to snag one of the watches to try out and loved it. I will get a full review up soon. 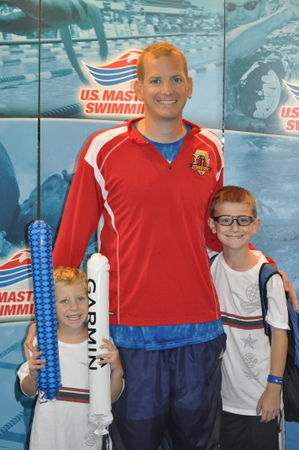 The whole experience was a lot of fun and I am definitely looking forward to swimming in more master’s swim meets. 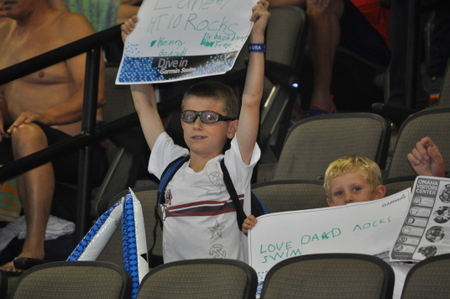 It was exciting to see so many different master’s swimmers from all ages and backgrounds. Ages of people participating in the meet ranged from 18-91 and every age in between. There were several former Olympians swimming in the meet with the most recent being, Misty Hyman (gold medallist in the 200 fly, 2000 Olympics). 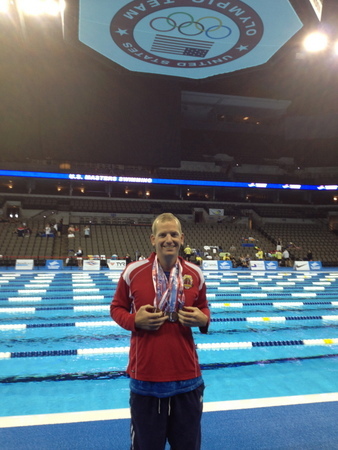 There were also several swimmers competing in master’s nationals that swam in Olympic Trials last week. 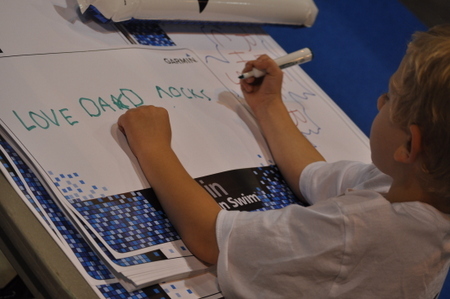 Needless to say there were lots of fast swims, several master’s world records were set in various age groups. It was inspiring to see people in their 70’s and 80’s still swimming and in some cases still swimming pretty fast. I can’t wait for the next meet and hopefully in 4 years they will have the meet in Omaha again. Suzanne will post a review of the meet from a spectator’s perspective soon. Live streaming of Nationals can be found HERE. He has less than a month to train; it runs July 5-8 in Omaha.